Sabyasachi Mukherji, now who doesn’t know this name? The great fashion maestro is famous for his intricate designs, tradition yet modern styles and embroidered patterns that have transformed the world of an Indian bride. Today, we would love to take you through all the inspiration that has gone behind his work. From ’70s Bollywood-inspired slinky sequined sarees to those that screamed of Calcuttan intellect (this theme is very close to his heart)—a declaration of love for boho-chic aura. With top stars such as Deepika Padukone, Sridevi and Kalki Koechlin seated in the front row cheering for his designs, Mukherji has actually got a great fan-following. So when we talk about Indian celebrities, then Vidya Balan emerges as the all-time brand ambassador for Sabyasachi sarees, but then there are others too that are a part of this club. Aishwarya Rai, Rani Mukherjee, Kajol, all of whom at some time have flaunted his collection and walked confidently at fashion shows, celebrity events or prestigious family occasions. And just when we thought that Sabya’s reflection of Bengal, with the entire collection inspired by the music, aroma and culture of the state has gone too seriously traditional, just then we see a reconstructed version of an Indian bridal wear. Sabya’s Indian bride right then goes all bold. A sharp move—from the textile-rich, old romance to shiny-rich, new romance. Oh! And did we forget to mention about the modern-day maharani look? Royal and opulent! A black bandh gala (aka high-neck which speaks of elegance) or a knit blouse teamed up with a gorgeous satin saree with lace pleats and polki earrings. His latest collection revolves around floral block printed chiffons with dori work blouses, hand printed tulle zardozi embroidered gharara sarees with jaal blouses, art deco embroidered sarees with raw silk blouses, scattered mirror work sarees with printed Kantha work blouses. 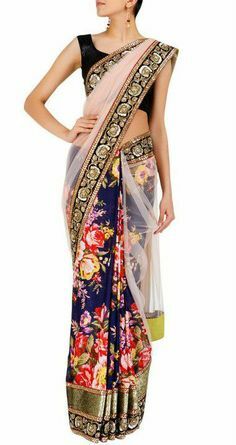 So, if you are looking for a saree that has traditional zardozi, and heavy embroidery on a rich fabric, such as georgette, chiffon, or raw silk but at the same time has a modern twist to create an antique look to die for. And you want that saree to run in your family, being passed on from one generation to another, then your search ends here. So, let’s give a loud applause to Sabyasachi Mukherji, the same great fashion maestro that almost every second Indian girl dreams of wearing on her wedding day. The same designer who has come a long way. Made waves on the international fashion scene with his innovative and breath-taking designs, using Indian textiles in a modern setting.